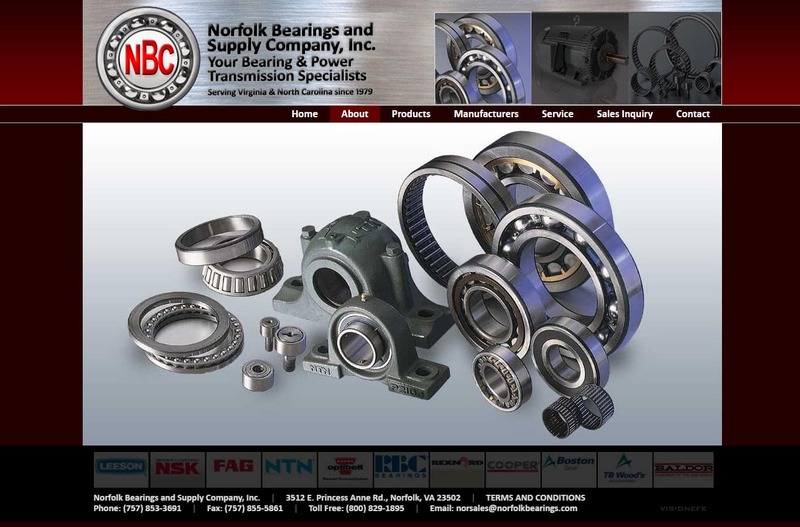 This is a Joomla CMS site framework for the Norfolk Bearings Company located in Norfolk Virginia. The SQL database contains over 100,000 records for product types and parts. Product records for thousands of products and parts. Customer buttons for sale or inquiry. Fast updating and deletions via an XSL or CVS upload. A manufacturing business or industry service business providing large inventories of parts and products requires a powerful product database to manage inventory records. It’s now more important then ever to have an online product interface to display the inventory online. At VISIONEFX we know database programming! Let us get your company inventory online! When searching Web site Designers Norfolk VA companies find VISIONEFX for all of your website needs. VISIONEFX provides website design small to medium businesses in Norfolk VA. Services include; custom web design, web development, eCommerce, SEO – search engine optimization and web maintenance services. Call VISONEFX at (757) 619-6456 or email direct to info@visionefx.net. Be sure to read our Top Google Reviews seen on GMB Google My Business pages. Our top reviews speak to our total commitment to provide top-notch web development and customer service.